It’s a bird! It’s a plane- no, wait, it really is a bird. AUTO: When this unit is placed on G, choose up to 2 locked cards, and unlock them. If you unlocked 2 cards with this effect, for this battle, this unit gets Shield +10000. Today’s card we’re introducing is “Genesis Beast, Destiny Guardian” from “Absolute Judgment” (on sale August 26th, 2016)! It’s the G Guardian of 《Link Joker》! When this card appears in the Guardian Circle, you can 【Unlock】 2 cards, and if you 【Unlock】 2 cards, this card gains Shield+10000!! At that level, its Guard becomes impregnable. Because there are few situations in which your ally Units are 【Lock】 when your opponent attacks, the 【Unlock】 of Units assists with the draw effect of “Alter Ego Messiah”. 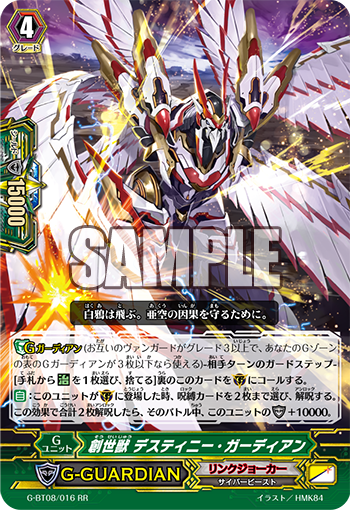 Also, this card does work well with “Death Star-vader, Demon Maxwell” who can 【Lock】 your Units during your opponent’s turn. This has limited use, but if you’re in a fight where both players are using 《Link Joker》, you should attack with particular concern of this card. If your opponent’s cards are 【Lock】, since they can can be 【Unlock】 during the Battle Phase, your opponent can counterattack in turn. Since there are still plenty of 《Link Joker》 support yet to come in “Absolute Judgment”, so keep your eye out for future information!